GOWANUS – Thousands of drunken Santas will wreak havoc at bars across Manhattan when SantaCon returns on Saturday, December 8. Avoid those sloppy Saint Nicks and stay in Brooklyn tomorrow instead. Parklife will be spreading holiday cheer throughout Gowanus with their Second Annual Anti-SantaCon Pub Crawl. “It’s all the fun of a holiday crawl with less of the mess,” claims the venue’s website. 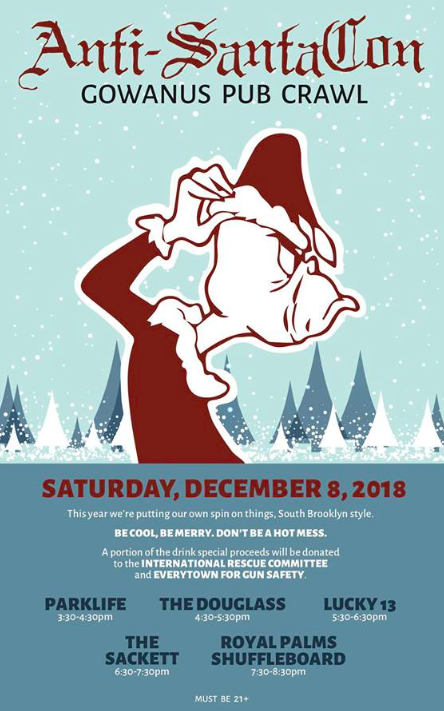 In the holiday spirit of giving, a portion of the proceeds collected from drink specials during the Gowanus Pub Crawl will be donated to two non-profit organizations—the International Rescue Committee, which helps people impacted by conflict and disaster, and Everytown for Gun Safety, which works to end gun violence and build safer communities. See the official Anti-SantaCon Gowanus Pub Crawl schedule below. Be sure to get to Parklife early before the crawl and shop their Holiday Market (12pm to 5pm). There will be a variety of holiday gifts ideas including color-changing gloves, hats, ceramics, natural soaps, and even treats for your furry friends. Learn more here.